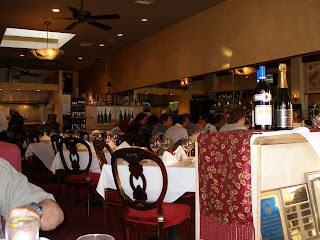 La Tosca is a small Italian Restaurant located on Laurel Street in San Carlos. It features authentic Italian food. The inside is pleasantly decorated and the seating is intimate, but able to accommodate small parties in a front corner booth or their side booths. 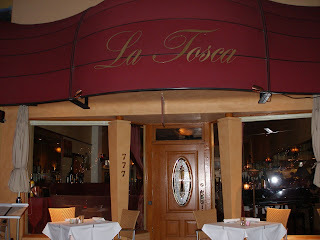 I have dined at La Tosca several times and have never had a bad meal. Each time I have dined at La Tosca, I have gotten a different menu item. This time I got the Petrale Sole al Limone…it was served with vegetables and potatoes. The fish and vegetables were very good, but the potatoes were not my favorite…they weren’t bad…I just wasn’t sure what kind of sauce came on them, possibly a marsala sauce--not my favorite. The last time I dined at La Tosca I had the gnocchi, which was most excellent. The service at La Tosca was, hands down, outstanding. The server, Haluk, was quite attentive and accommodating. We were celebrating the BF's birthday and Haluk made it a very special evening for us. I have never had bad service at La Tosca, not even when the restaurant has been completely packed. You can book reservations for La Tosca through OpenTable and, before I left for vacation, I purchased a $25 gift certificate at a very reduced rate on at Restaurant.com…an excellent value. La Tosca is an excellent choice if you are looking for a romantic dining experience or for special occasions. Actually, La Tosca is just good any time.